Valentine’s Day is the second busiest day of the year for dining out, but you can’t go wrong if you plan ahead for a special date at your favorite restaurant. Our annual roundup of Valentine’s dinner deals runs the gamut from steak to pizza to ice cream, from fine dining to fast food deals, so there’s something for every taste and budget. Many deals are good past Valentine’s Day–you can find them highlighted in red below. Bakers Square has a Sweetheart Dinner Special for 2 that includes two Just Right Portion Entrees and two slices of pie for $19.99, available February 13 – 15, 2015. Just Right Portion Entree selections include Ultimate Mac & Cheese, Ultimate Mac & Cheese w/ Chicken, Fish & Chips, Chicken Tenders, Savory Pot Roast, Slow-Roasted Turkey, Honey Mustard Chicken, Asian Chicken Stir-Fry and Chicken Pasta Primavera (at participating locations). Click here for more details. Valid only at participating restaurants. Not valid with other offers, promotions or discounts. Tax and gratuity not included. 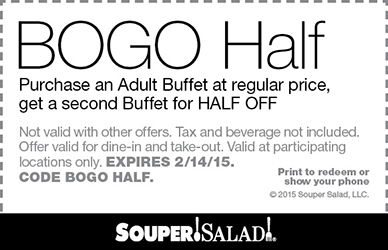 Valid 2/13/15 – 2/15/15. Baskin-Robbins is taking orders for their specialty Conversation Heart Cakes, which are the perfect way to share a delicious treat and a personalized message with your loved ones. Heart Cakes come in two sizes (small serves 2 – 4; large serves 10 – 12) and can be customized with a personal message. Large cakes include the option to choose the flavor of ice cream in the cake. Click here to start your order. Bertucci’s has a Valentine’s Day Dinner for Two for $35, available Monday, February 9 – Monday, February 16, 2015. Dinner for Two includes two appetizers, two entrees and a dessert to share. Upgrade to a steak or lobster entree for an additional $5 per dish. Dine-in only. Visit the Bertucci’s website to view the full menu. Bob Evans is serving up Double Chocolate Cherry Hotcakes on Valentine’s Day weekend, from Friday, February 13 – Sunday, February 15, 2015. Bob Evans announced this Valentine’s Day special on their Facebook page. Bojangles’ is bringing back their Heart-Shaped Bo-Berry Biscuits to celebrate Valentine’s Day. From Sunday, February 8 – Sunday, February 15, 2015, at participating locations, you can get two Heart-Shaped Bo-Berry Biscuits for just $0.99. Heart-Shaped Bo-Berry Biscuits are also available by the half-dozen and dozen. Bojangles’ made the announcement in this press release. Bonefish Grill has a three-course Valentine’s Dinner for 2 available February 9 – 15, 2015. Enjoy a salad, your choice of Filet & Lobster Tail or Imperial Topped Sea Bass, and a Chocolate Crème Brulee to share for just $29.90 per person. Click here to make reservations. Buca di Beppo has a Valentine’s meal for two for $48 available February 13 – 15, 2015. The meal includes Heart-Shaped Lasagna for two, a Buca Small Mixed Green or Caesar Salad, Garlic Bread and two Mini Cannoli. Click here to make reservations. Dine-in only. While supplies last. No coupons or other discounts may be used/redeemed on the Valentine’s Weekend Menu. No substitutions. Excludes tax, tip and gratuity. California Pizza Kitchen has a Valentine’s Sweet Deal for 2 menu available Wednesday, February 11 – Sunday, February 15, 2015. Choose an appetizer, two entrees and a dessert for just $32. Click here to see the full menu. Price excludes beverages, tax and gratuity. No modifications or substitutions. Cannot be combined with any other offers, including $20 promotional cards. Dine-in only. Not available in Hawaii locations. Champps Americana has a three-course dinner for two for $50 available Thursday, February 12 – Sunday, February 15, 2015. Three-course dinner includes an appetizer to share, two entrees and a dessert to share. Featured selections include Calamari Fritti, Champagne Chicken & Shrimp, Lobster & Shrimp Vodka Penne, Chocolate Whiskey Cake and more. Available at participating locations only. Visit the Champps website to view the full menu. Cheeseburger in Paradise has a four-course dinner for two for $35.99 available Thursday, February 12 – Sunday, February 15, 2015. Featured selections include the CIP Kiss Cocktail, CIP Signature Burger and Chocolate Nachos. Dine-in only; available at participating locations only. Visit the Cheeseburger in Paradise website for more details. Chevys Fresh Mex has a three-course Valentine’s Dinner for 2 for $39.99 available Friday, February 13 – Sunday, February 15, 2015. Valentine’s Dinner for 2 includes one starter, two entrees and one dessert. Available at participating locations only. Visit the Chevys website to view the full menu. Dunkin’ Donuts is celebrating Valentine’s Day with White Chocolate Raspberry Flavored Lattes and heart-shaped donuts. Visit the Dunkin’ Donuts website for more details. Price and participation may vary. Limited time offer. Einstein Bros. and Noah’s Bagels are taking pre-orders for heart-shaped bagels. Choose any bagel flavor and pre-order by February 11, 2015, at your neighborhood bagel shop, then pick up your bagels on February 13 or 14, 2015. Excludes Gourmet Bagels. Catering not included. Firehouse Subs has a Valentine’s week coupon for a free cookie, good February 9 – 15, 2015. Check out this post to print your coupon. Fleming’s Prime Steakhouse is serving their annual three-course Valentine’s Day dinner starting at 4 PM on February 13 – 15, 2015. Enjoy Filet Mignon paired with your choice of Pecan-Crusted Salmon for $59.95 or a delicious 8-oz Lobster Tail with drawn butter for $69.95. The Valentine’s menu also boasts a special selection of wines and Toasted Marshmallow S’more Cheesecake ($9.95) as the featured dessert. Click here to make reservations–this event sells out every year. Excludes tax, gratuity, dessert and wine. Available only 2/13/15 – 2/15/15. All locations open at 4 PM, and our 5 for $6 ’til 7 menu will be available at 4 PM 2/13/15 – 2/15/15. Fleming’s abides by all state and local liquor laws. Icon wines unavailable in Tulsa, Salt Lake City and Radnor. Genghis Grill has a Valentine’s Day special for two: Get two regular stir fry bowls and a dessert for $24.95. This offer is valid February 13 – 15, 2015. You could also win a $50 Genghis Grill gift card by entering Genghis Grill’s Facebook photo contest, now through February 12, 2015. Upload a photo of you and your “special someone” to Genghis Grill’s Facebook page for your chance to win! The winner will be announced on February 13, 2015. HomeTown Buffet, Old Country Buffet and Ryan’s have special gifts for guests who dine with them on Valentine’s Day, February 14, 2015: Guests will receive a Two Can Dine for $17.99 coupon and a single dinner for $8.99 coupon, while supplies last. Good for future visits; valid through February 22, 2015. This offer will be available at all 319 restaurant locations. The bakery will also be serving a special Valentine’s Day dessert. HomeTown Buffet, Old Country Buffet and Ryan’s announced these offers in this press release. Hooters Sports Bars have two 10-piece chicken wing orders for just $14 on Valentine’s Day. No coupon required. More details in this Hooters press release. Jersey Mike’s has a Valentine’s coupon for a free chip and drink with any regular or giant sub purchase, good now through Sunday, February 15, 2015. Check out this post to print your coupon. Kona Grill has a three-course Valentine’s Day dinner for two for $100 per couple ($80 without wine). The dinner includes wine (Chandon Brut), a starter to share (any starter or Kona Roll), two entrees (choose from Miso-Sake Sea Bass, Kona Filet Oscar or Rack of Lamb), and Chocolate Fondue to share for dessert. Price excludes tax and gratuity. Kona Grill announced the offer in this email to subscribers. Krispy Kreme is offering five varieties of special Valentine’s-themed doughnuts: Sprinkled Heart, Chocolate Iced Heart, Kiss, Hug and Luv Bug. For more information, check out this post. Also during Valentine’s week, Krispy Kreme lets you send a free eCard to someone special; details at this Krispy Kreme website. McDonald’s will randomly select customers to Pay with Lovin’, now through February 14, 2015. You could receive your McDonald’s order for free just for performing a “random act of Lovin'”. No purchase or order necessary; not available in Drive Thru. See the official rules for complete details and availability. Lone Star Steakhouse has a special Valentine’s Day menu available February 12 – 15, 2015. The menu features a Tejas Shrimp Cocktail made for sharing ($8.99), Cupid’s Steak & Lobster ($25.99) and “Some Berry Loves You” Cheesecake ($6.99). Visit the Lone Star website to see the full menu. Pricing may vary in CA and AK. See restaurant for full details. You could also win a free Valentine’s Day dinner for two by entering Lone Star’s Facebook contest. Upload a photo of your Valentine to Lone Star’s Facebook page and tell them why your sweetheart is the sweetest. Five lucky couples will win a free dinner for two, and all entrants will receive a Facebook coupon for a free Bloomin’ Rose! Contest entries must be submitted by February 9, 2015, at 11:59 PM CST to win. Winners will be announced on Facebook on February 11, 2015. Macaroni Grill has this Valentine’s dinner special: order any dinner meal, and for just $12 more, add two antipasti and a dessert. More details on the Macaroni Grill Facebook page. Maggiano’s Little Italy has a That’s Amore! Meal for Two available Thursday, February 12 – Wednesday, February 18, 2015. The That’s Amore! menu includes any appetizer, flatbread or two side salads; two entrees; one dessert; and two glasses of wine, plus a small box of Chocolate Zuccotto Bites, compliments of the chef. Click here to make reservations. The Melting Pot often has special deals available during the week of Valentine’s Day. Specials vary by location, and reservations are strongly recommended. Click here to find The Melting Pot nearest you and make reservations. Morton’s The Steakhouse has a Steak and Lobster Valentine’s Day Meal for $55 per person. More details at the Morton’s website. A Bloomin’ Onion and Classic Cheesecake dessert to share, paired with two 6-oz Outback Special Sirloins, two freshly made sides and two signature side salads, starting at just $32. Price and participation may vary by location. Make your Valentine’s meal even better by adding a lobster tail for half the price! You can also upgrade your meal with two 8-oz Outback Special Sirloins or two 6-oz Victoria Filets. Plus, Outback makes planning your Valentine’s celebration even easier with their new Click Thru Seating, which allows you to view the real-time wait time of any Outback location and put your name on the wait list for now or later that day. Simply visit: http://www.outback.com/seating to get seated faster today. The Palm has a Surf and Turf Valentine’s Day Meal for $95 per person. The meal includes half of a Broiled 4 lb. Jumbo Nova Scotia Lobster and half of a Prime New York Strip 18 oz OR half of a Filet Mignon 14 oz. To view the full Valentine’s Day menu, click here. P.F. Chang’s has a Valentine’s Hot and Spicy Menu for Two for $45, available now through February 15, 2015. The menu features three new dishes, including Firecracker Chicken, Flaming Pork Wontons and Chinese Red Wine & Pepper Braised Beef. These new dishes are also available a la carte for a limited time. Click here to make reservations. Qdoba is encouraging their guests to get a little saucy this Valentine’s Day: Order one Smothered Burrito and share a smooch with a loved one, friend or willing stranger on Saturday, February 14, 2015, and get a second Smothered Burrito on the same visit for free. Offer valid at all participating restaurant locations. Check out Qdoba’s press release for more details. On February 12, Qdoba will introduce the new Savory Queso sauce to their lineup of Smothered Burritos. Shoney’s has a 2 Can Dine for $24.99 Valentine’s Day Weekend special. From 4 PM to close February 13 – 15, 2015, visit Shoney’s to enjoy a special buffet featuring Herb-Roasted Salmon, BBQ Ribs, 4-oz steaks, Stuffed Crab Royale, Peel & Eat Crispy Fried Shrimp, Whole Crispy Southern-Style Catfish and more. Also includes one dessert to share. Visit the Shoney’s website for more details and to view the full menu. Sizzler has a Valentine’s Sweetheart deal for $19.99 on February 14, 2015. Includes a fire-grilled tri-tip steak and lobster tail. Visit the Sizzler website for a list of participating locations. Starbucks and Match will be hosting the World’s Largest Starbucks Date on Friday, February 13, 2015. Select Starbucks locations in the U.S. and Canada will feature a special pairings menu. In the U.S., coffee and treat pairings will be available for $5 from 2 PM to close and include: Caffé Verona Coffee Press for Two and a Double Chocolate Chunk Brownie; Tall Flat White and Chocolate Croissant; and Grande Raspberry Mocha or Grande White Chocolate Mocha and Heart Cookie. Special in-store music playlists chosen by Starbucks employees and themed photo props will help create the perfect #StarbucksDate atmosphere. See the Starbucks home page and Starbucks press release for more information. Tony Roma’s has a Valentine’s Day Dinner for Two for $45. The Dinner for Two includes an entree and dessert. For dinner, choose from Filet Medallions, Grilled Salmon or Tony Roma’s Original Baby Back Ribs. For dessert, choose Red Velvet Cake or Raspberry Brownie Royale. Available at select Florida locations: Orlando (I-Drive), Doral and Sunny Isles Beach. Waffle House is now accepting Valentine’s Day dinner reservations. Click here for a list of participating locations. White Castle has their annual Valentine’s dinner with tableside service at select locations from 4 – 10 PM on Saturday, February 14, 2015. Seating is limited and reservations are required, so visit the White Castle website to reserve your table in advance. According to the National Restaurant Association, Valentine’s is second only to Mother’s Day as the most popular holiday for dining out. The NRA says about one-quarter of Americans dine out on Valentine’s Day, and nearly one-third say they would also like to receive a restaurant gift card for Valentines. When presented with a list of six possible Valentine’s Day gifts, nearly one-third of the consumers who were polled favored restaurant gift cards, followed by jewelry, clothing/apparel, flowers, chocolate and perfume/cologne. St. Valentine’s Day began as a liturgical celebration of one or more early Christian saints named Valentinus. Several martyrdom stories were invented for the various Valentines that belonged to February 14, and added to later martyrologies. A popular hagiographical account of Saint Valentine of Rome states that he was imprisoned for performing weddings for soldiers who were forbidden to marry and for ministering to Christians, who were persecuted under the Roman Empire. According to legend, during his imprisonment, he healed the daughter of his jailer, Asterius. An embellishment to this story states that before his execution he wrote her a letter signed “Your Valentine” as a farewell. The day was first associated with romantic love in the circle of Geoffrey Chaucer in the High Middle Ages, when the tradition of courtly love flourished. In 18th-century England, it evolved into an occasion in which lovers expressed their love for each other by presenting flowers, offering confectionery, and sending greeting cards (known as “valentines”). Valentine’s Day symbols that are used today include the heart-shaped outline, doves, and the figure of the winged Cupid.